A Police and Crime Commissioner says Brexit preparations have delayed plans to free officers from their duty of ticketing illegally parked cars. 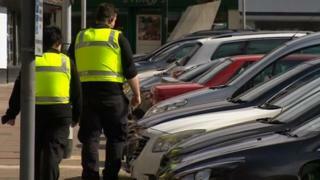 Suffolk's Tim Passmore wants to transfer the job from the county's police officers to traffic wardens. He claims the legal paperwork needed to make the switch is being delayed as ministers tackle Brexit issues. The Department for Transport said relevant legislation would be passed "in the second half of the year". Most parking tickets in Suffolk are issued by police officers, except in Ipswich where the council employs traffic wardens. Mr Passmore wants this civil system to apply to the whole county, and he has been backed by the county council and six other district councils, which do not currently have their own traffic wardens. "This change will release valuable police time to do other far more important things like catching criminals," said Mr Passmore. "There is a log jam in various government departments because of Brexit and it is very frustrating. Please can we just action this?" Image caption Tim Passmore says illegal parking amounts to "anti-social behaviour"
Mr Passmore said the revenue from parking fines collected by police currently went to central government, whereas council-run schemes would keep the revenue. In 2017-2018, the cost of running the parking enforcement system in Ipswich totalled £1.1m while revenue from parking tickets, which helped to offset the bill, was £432,000. Prof Tony Travers, from the London School of Economics, said Brexit had become "all consuming" for the government and civil service. "Things are being left to drift because Whitehall has no capacity to think about anything other than 'no deal' planning," he said. A Department for Transport spokesman said the Suffolk application was "subject to legislation which we aim to pass in the second half of this year". Sunday Politics East is broadcast at 11:00 BST and is available on the BBC iPlayer afterwards.